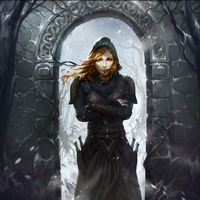 Alisanne Dupre was a member of the Dark Brotherhood who had become the Listener of the Black Hand by the year 4E 187. Some stories claim that her father, Uther Nere, had murdered her mother when she was a young woman, and she fled to join the Brotherhood, vowing to take revenge as an assassin. Dupre maintained a private residence in Bravil, from which she commuted to the Brotherhood's last Cyrodilic sanctuary in Cheydinhal. While there she discussed the state of the Brotherhood with Rasha, her last remaining Speaker. Among the topics they discussed was the destruction of the Wayrest sanctuary, and the potential re-opening of the Shadowscale training facility in Archon, Black Marsh, a plan that was ultimately abandoned due to lack of funds. When the feud between Bravil's two largest skooma traffickers turned violent, Dupre was forced to hire a battalion of sellswords to protect her and her property. Ultimately the effort proved futile, and Dupre was killed while attempting in vain to guard the Night Mother's crypt from desecration, incinerated by a fiery spell cast by a mage, who some stories claim was her own father. Given her name, it is highly likely that Alisanne was a Breton. This page was last modified on 21 October 2018, at 07:55.